In the U.S., about 2,000 arc burn related injuries require hospitalization. These injuries have become a major concern, particularly in regard to medium voltage arc faults. Currently there is no agreed upon standard for arc resistant medium voltage drives. There are, however, solutions claiming some form of arc resistant capability. 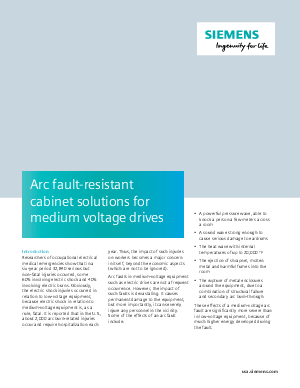 The paper “Arc fault-resistant cabinet solutions for medium voltage drives” explores both the causes of arc faults and the solutions that can help protect personnel from injury. Download the paper to learn more about this important issue.